So, here's my dilemma that I need advice on. Remember this chair? Well, it's in a new home with new furnishings. I recovered it a few years ago and now I'd like to recover it again in something that coordinates better with the white sofa, Chiang Mai dragon pillows, contemporary artwork and brighter colors. However, I would really like to keep it timeless so that I can switch pillows and change the room decor without having to recover it again. I don't want to get rid of it because it originally cost $10 and it's a well made, comfortable chair. 1. This is my first choice. I love this chair from a Sarah Richardson (my dream design BFF) room. I love the color and the ticking piping (something that I plan on doing with this chair). I like the gray velvet but I just don't know how I could swing something like this financially and I cannot find this soft, dove gray anywhere!!! And is it too much gray in the room? If anyone has any tips out there, I'm open to suggestions! I've been to a dozen "great" fabric stores here in San Diego and they are all really lame. Very disappointing. 2. I also like the option of a large stripe like this one (again, Sarah Richardson is amazing). I think it would go well with the rest of the room and it's a classic look without being too contemporary or too traditional. I'd love to use something like this oversize stripe by Dwell Studio but, you know, $32/yard is kind of outrageous. 2. I did consider something crazy fun like a bright green chair or even blue. I think it would be cute for a little while but it won't last very long before I'm tired of it. It's also a little too "funky" because I want the room to be colorful but still sophisticated. 3. While I think it would be fun to do a crazy pattern (the above is way out of my comfort zone but I still think it's cool), I feel like sticking to a solid won't compete with pillow patterns which is great since I love to switch up my pillows. I also don't want to destract from my rug which I love, love, love. I love the bright, crazy prints, but I agree that they'd be cute for awhile and then become annoying. Go with the bold stripes!! I love that look! Liz, google "gray velvet upholstery fabric" (or whatever kind you're looking for) and then check the sources that come up. Most places will send you a swatch so you can feel the fabric, etc. I like the gray velvet as well, or the gray stripe. go with gray! if not velvet, then like a wool/tweed would be cool, or maybe a good gray canvas. the room is beautiful! I gasped when I saw that first gray chair. I think you should do that one, and then make one for me as well! Hi, have you checked out UFO in National City, they are a huge upholstery fabric warehouse but they can be pricey too. I know it is a bit of a drive but the fabric district in downtown LA has amazing and beautifulnfabrics and it's super inexpensive. Oh and I LOVE the gray. I love the gray the best. I also really like the thick stripe. Have you checked online fabrics? I bet you can get a sample and a good deal. I really like the original chair you recovered. I think it is such a great fabric and the colors are amazing. But I do love the first grey chair, too. I like them all. I am especially loving the solid gray and big stripe too. The solid gray might go the best with the rug. that's "i love sarah richardson." I like the silver one with the interesting pipping. It has a bit more longevity. i love the grey with the piping...it's amazing! If you like the grey stripe enough I think it's worth spending the money.... a chair that size won't require that much fabric, so it's still pretty cheap. But you should LOVE it. The stripe is relatively conservative and in a neutral color so it will "keep" for a long time, but it's still fun. It's an accent chair, after all! The solid grey is lovely, but I don't think it goes with your style, and frankly I think it's too plain... you would grow tired of it. It would be better for a sofa which needs to be more "basic." Is there a way you could put up a tutorial for how to recover a chair? I have a gorgeous chair hand-me-down from a great aunt with ghastly 70s fabric. I was saving my money to recover, but maybe I could do it myself???? What about a multicolor small stripe? Something that will pull in the blue rug/chair, bright pillows, yellow walls, and bright floor, green outside (the window). Everything else in the room is big and bold solid colors, it might add some variation. 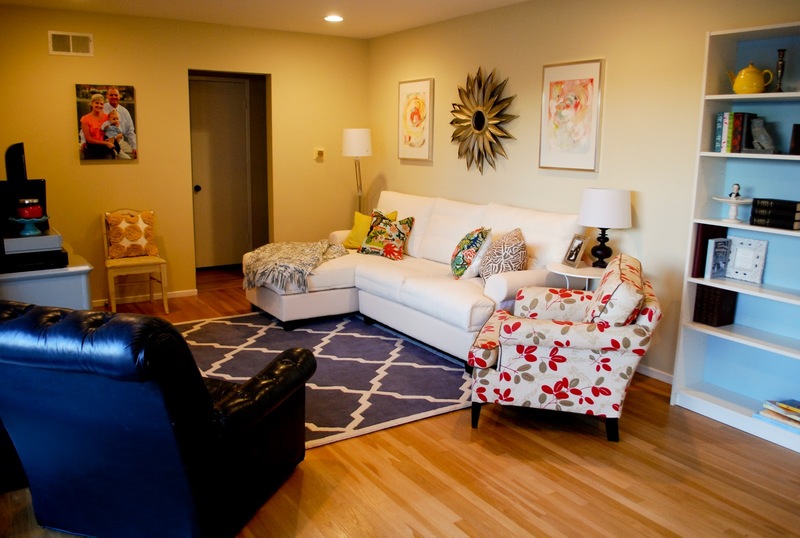 Or another floral, which pulls in the bright primary color blue in the rug. The stripe! 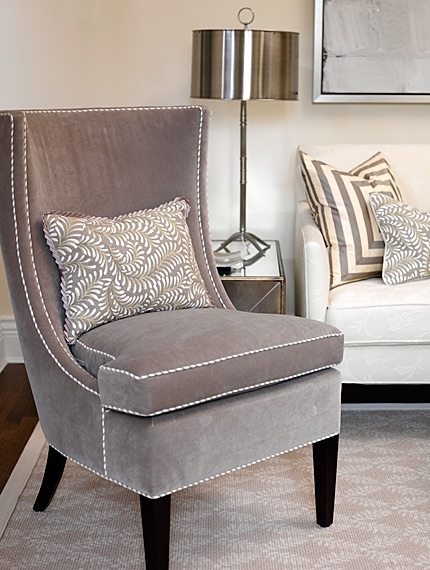 Great for an accent chair. You can always change up your pillows, throws, rugs etc if you tire of the "look". You have a lot of bright accents - covering it in something neutral will give you a lot more flexibility in color and decor changes to freshen things up. I'd go with a stripe - adds some visual interest, but is still neutral. They're all cute options, though! I love the gray velvet with the ticking stripe! I was going to suggest the fabric district in LA, which someone else mentioned. I saved an article about it from a magazine, if you want me to find it. It seems like the perfect place to find some great fabric, if you are willing to drive. I think it's time for another day trip to the LA garment district for fabric and notions... Best place to find any fabric on the planet. I must admit I really like the chair just as it is--I think it adds great variety to the room! Sometime, you'll run across something you love to change it too, but for now, I think it is great!